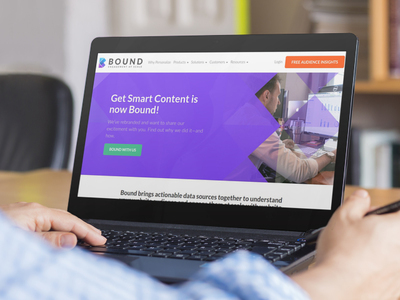 Bound’s 360 Persona Technology is designed to help marketers understand their anonymous web visitors and engage them with real-time web personalization. The technology binds together fragmented data sources into a 360-degree digital persona. The platform also leverages more than 20 data sources, including LinkedIn, Bombora, ClearBit, Kickfire, Tealium, native website data and marketing automation platforms, such as Marketo and Eloqua. The platform can organize the data into five types of attributes — firmographic, demographic, offsite intent, onsite behavior and marketing automation platform custom fields — to develop a vendor’s 360-degree personas.